Imperial Russia’s Baltic Fleet, destroyed by the Japanese in 1905, had been rebuilt by 1914 intro a respectable force. By 1922 it had once again been destroyed in the course of the Great War, the Russian Civil War, mutinies and insurrection, and an extremely destructive British intervention. The new Soviet Union inherited the battered remnants, and slowly set about rebuilding its naval forces. That slow phase came to an end in the mid-1930’s, when General Secretary Josef Stalin directed that the Soviet Union’s newly-created heavy industry would turn its potential to building a first-class battle fleet, with flotillas of gigantic battleships at its core. Very little of this fleet had been completed when the Axis launched their sneak attack in June 1941 and once again the tides of war steadily destroyed what had been built up. The Red Banner Baltic Fleet made little use of its surface ships beyond fire support during the siege of Leningrad. Apparently far too many key specialists had been drafted into naval rifle brigades during the course of the war and never returned to the fleet. The ships had full crews, but training standards had been seriously eroded. On paper – where wargames are fought – the Baltic Fleet remained a potentially strong though not overwhelming force. And the ships projected for the future would make it very strong. 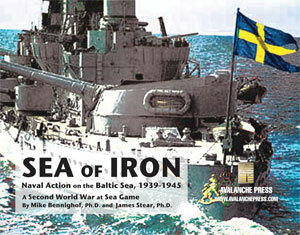 Here’s a look at what we’ve included in Second World War at Sea: Sea of Iron. Sisters of some of these ships appeared in Black Sea Fleets; for Sea of Iron we’ve replaced all of the ship drawings with new and much more attractive ones. For almost two decades, the Baltic Fleet’s war plans centered on the two old battleships of the Gangut class, Marat (the former Petropavlovsk) and Oktyabrskaya Revolyutsiya (the former Gangut). These survivors of the Imperial Navy underwent large-scale modernization in the early 1930’s. Oktyabrskaya Revolyutsiya received the oil-fired boilers intended for the cancelled Imperial battle cruiser Izmail, while Marat had her coal-burning boilers reworked to burn oil. Neither solution worked particularly well. Both ships received upgrades to their main armament (chiefly improved elevation to increase their maximum range) and new anti-aircraft arrays. Poorly designed ships when new, age had not improved their fighting ability despite the badly-engineered and -executed re-construction. Yet as the only heavy ships available to the Baltic Fleet, they took center stage in Soviet war planning. During the war itself, they could not be risked in the open sea and never ventured out of the eastern half of the Gulf of Finland, providing fire support during the Winter War, the 1941 Siege of Leningrad and the 1944 Oranienbaum offensive. A third sister, Sevastopol (renamed Parizhaya Kommuna, later reverting to her original name) transferred to the Black Sea in 1928, and so appears in Black Sea Fleets. A fourth, Poltava (renamed Frunze) suffered a fire in November 1919 that started in the forward boiler room and spread throughout the ship as the ill-disciplined crew panicked and fled. Pretty much gutted, she underwent partial rebuilding toward restoring her to a state similar to her sisters, but the work stopped and ultimately Frunze only saw use as a barracks ship and source of spare parts. The hull continued to intrigue Soviet planners; Soviet shipyards had difficulties laying down large ships and the old battleship seemed an opportunity that should not be wasted. Naval constructors studied converting her to an aircraft carrier and into a fast battleship. The latter project had Great Stalin’s approval, and design work showed a fast ship with one turret removed and another moved to a superfiring position forward. Moving a heavy gun turret is a major undertaking, mostly because of the barbette, the armored structure underneath. No other nation actually re-located a heavy gun turret during a battleship modernization, and even when removing one the designers often left the barbette in place (as with the conversion of the Japanese super-battleship Shinano into an aircraft carrier). The huge weight of the armored barbette under the superfiring turret surely would have posed too great a strain on the old hull, even if the Ordzhonikidze shipyard in Leningrad charged with the project had been capable of performing the work and the naval budget had allowed for the enormous cost. On paper, at least, Frunze would have been a middling fast battleship, with weak protection, some speed and fairly weak armament. You can try her out for yourself; we’ve included a piece for the fast battleship project in the game. Great Stalin wanted a true blue-water navy, and that meant battleships. Really big battleships. We’ve included Sovetskiy Soyuz, name ship of her class of 60,000-ton behemoths known as Projekt 23 in Soviet naval planning. Armed with nine 16-inch guns, the big ships had heavy armor protection and, for ships designed in the 1930’s, heavy anti-aircraft armament. Sovetskiy Soyuz, laid down in the summer of 1938, stood at about 40 percent complete at the time of the German sneak attack and had not yet been launched. Originally scheduled for completion in 1943, after some thought was given to completing her (perhaps with a missile battery) she would be scrapped after the war. To supplement the huge battleships, the Red Navy also projected a large class of battle cruisers known as Projekt 69. Sixteen ships were projected, to serve in all four fleets (Northern, Baltic, Black Sea and Pacific). The ship constantly grew, from a “Washington Cruiser Killer” armed with 10-inch guns to versions with 11-inch and 12-inch guns and finally one with six 15-inch guns mounted in turrets originally built in Germany to re-arm the battle cruisers Scharnhorst and Gneisenau and sold to the Soviet Union instead. We’ve gone with the version actually laid down at Leningrad’s Marti shipyard in November 1939 before her final plans had been approved, to be named Kronshtadt. Great Stalin declared these ships his favorites and he personally oversaw first their design and then their construction, leading to numerous delays in both processes. In August 1940 he ordered construction halted to re-work them to carry the German main turrets and German 5.9-inch guns as their secondary weapons, as Projekt 69-I. The Germans stalled delivery of the big guns, which never arrived in the Soviet Union. And so the piece in the game represents the Projekt 69 design with nine 12-inch guns and a secondary armament of four 5.1-inch guns.